WASHINGTON ““ Teenager Adam Nesenoff and his father, Rabbi David Nesenoff, are pretty far down the media food chain. The son, an active member of the National Council for Synagogue Youth, the Orthodox Union’s affiliated youth group, runs his own newsy site, Shmoozepoint.com. Dad operates a website called RabbiLive.com and sometimes portrays the satirical character of Julio Ramirez, a Hispanic priest who teams with a rabbi to deliver “Holy Weather” reports. So it was impressive enough that both managed to snag media credentials for the American Jewish Heritage Month celebration May 27 at the White House. But in the past week, the senior Nesenoff took things to another level, turning his few hours as a hobnobber into 15 minutes of fame as the YouTube journalist who brought down a media icon. 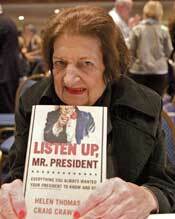 As the world now knows, Helen Thomas sure did. Nesenoff asked where she thought they should go. The rabbi didn’t post the video until June 3, but it quickly gained national attention, unleashing a flurry of demands for Thomas’ marginalization, if not dismissal. On Monday, Thomas, 89, heeded the calls and quit, according to her employer, the Hearst Corp. Thomas’ phone number was not answering. The Nesenoff video went viral after being picked up by Yidwithlid, a popular site run by the conservative commentator Sammy Benoit, and then posted to the hyper-popular conservative video site Breitbart TV. That’s when the complaints started: First out of the box was B’nai B’rith International, which issued a June 4 statement from its president, Dennis Glick, demanding that Thomas be fired. A diverse slew of other Jewish organizations soon followed with their own condemnations. Officials of the two most recent administrations – Ari Fleischer of the Bush administration and Lanny Davis of the Clinton administration – also slammed Thomas and called for her to be sacked. The first death knell for Thomas’ career, though, probably came when she found herself being criticized on liberal Websites such as Huffington Post and Talking Points Memo, which have long lauded her for asking discomfiting questions of presidents – particularly her encounters with George W. Bush during the Iraq War. Joe Klein, the Time magazine scribe who has been a tough critic of Israel’s Netanyahu government, called her views “odious” and said she should no longer have the privilege, accorded by the White House Correspondents Association, of a front row center seat. Thomas’ apology, posted June 4, preceded most of the broadsides against her. Critics, including the Anti-Defamation League, said it did not go far enough. By Monday, such requests appeared moot: After a series of blows, it was clear her career was finished. On Sunday, Thomas was dropped by her speaking agent, Nine Speakers. The following day, the Washington Post reported that Walt Whitman High School in Bethesda, Md. – a Washington suburb with a substantial Jewish population – was withdrawing its invitation to Thomas to be commencement speaker. The die was cast: Midday Monday, Hearst announced her retirement. It was a rapid fall for a woman who had become a liberal icon. Thomas was a perennial, admired for becoming, during the Kennedy administration, one of the first women to cover the White House beat. She was granted the first question at news conferences, and finished each conference with a “Thank you Mr. President.” She earned the ultimate Washington status symbol: cameos in movies about politics. Her posture as maverick was something of a feint: Washington has long nurtured an establishment journalist culture that cozies up to power, and Thomas since the 1960s was one of its denizens, hobnobbing with the Kennedys, the Johnsons, and their confidants. Thomas, the child of Lebanese immigrants, was known to be a fierce critic of Israel and what she saw as the unwillingness of successive U.S. administrations to speak out against Jerusalem’s supposed misdeeds. Her most recent encounter with Gibbs, after Israel’s raid on a Turkish-flagged aid ship, came after her remarks to Nesenoff but before he revealed them to the world. Dan Mariaschin, the director of B’nai B’rith, said Thomas’ comments should have come as no surprise. Mariaschin acknowledged that the timing was against her. B’nai B’rith would have called for her dismissal even without the opprobrium visited on Israel after the flotilla raid, but it didn’t help, he said. “The timing was such that, coming as it did right after the flotilla issue, I think perhaps it brought her comments into even starker focus,” he said. Nesenoff, of Stony Brook, N.Y., said he had accompanied his son and his friend to share the joyful experience of the White House’s Jewish celebration. Adam Nesenoff, 17, who in addition to running his own Website is his father’s Webmaster, had applied for a media credential after hearing that the event would have a youthful emphasis. The elder Nesenoff asked the White House if he could join his son, explaining that otherwise he would be stuck outside the whole day waiting to drive him home. They wandered the grounds near the White House press room before the event. Rabbi Nesenoff said he pointed out Thomas to the teens because she was a press icon. He was vaguely aware she had views critical of Israel, but did not think she would be so outrageous. Nesenoff said he still hopes for a more expansive apology from Thomas.